Wally has a home! 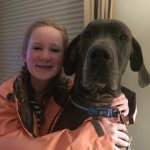 - Rocky Mountain Great Dane Rescue, Inc.
Wally has a home with his foster family, Mike and his 3 children, in Highlands Ranch, CO! 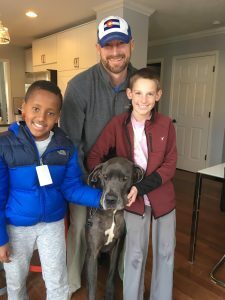 After meeting Wally at an event, Mike and his kids were smitten with him.When the opportunity arose to foster him, they didn’t hesitate. Wally was dealing with some allergies and skin issues, but with the families’ help giving him weekly baths, and the right medications, his coat is now shiny and healthy! Wally can now focus more on playtime than on his itchy skin! Wally is enjoying his new family so much, and with Mike working from home, he is never alone for too long.Wally will be the only dog, but his new human siblings Brooke, Levi, and Remi, keep him pretty busy, and even have an Instagram page for him! Mike will be volunteering with us, so you may even get to meet Wally at an upcoming event! Way to go sweet boy!